Almond growers have been a-buzz on the topic of bee hours. The concept of a bee hour was designed as a proxy for the amount of good bee foraging weather that occurred during almond bloom. A “good” bee hour is accumulated for each hour of weather that is 1) not raining, 2) wind speeds less than 10mph and 3) warmer than 59oF [Minimum flight activity thresholds are thought to occur closer to 55oF and <15mph wind, sometimes cited as a “poor” hour]. Bee hour counts begin accumulating around the time that early cultivars begin blooming, and carry through petal fall. 2019 is one of our wettest blooms in recent memory, and reminded many of the growers who have been in the industry awhile of some of the industry’s biggest crop failure years (1959, 1986, see Figure 1). 2019 bee hour accumulations reflect the weather that we’ve experienced. From February 16 (onset of bloom at the Regional Almond Variety Trial) to March 5, bee hour accumulations from the Durham CIMIS station totaled roughly 36 bee hours. 36 hours does seem dismal – if, in fact, bee hours are a good predictor of nut set. While the concept seems logical on its face, the relationship is a little less clear. Joe Connell (UC Farm Advisor Emeritus, Butte County) compared the average yield in Butte county (data from Ag Commissioner’s crop report) and bee hours in Butte county (Durham CIMIS station; calculated from 1% Sonora through 100% Mission bloom) from 1985-2011 (Figure 2). There is a slightly positive relationship, with higher yields generally occurring in years with more bee hours. 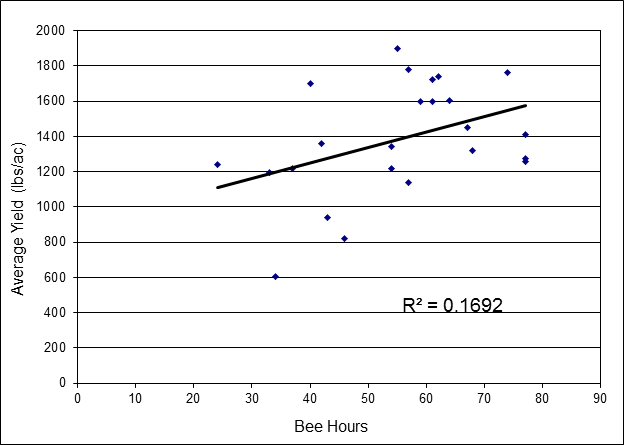 However, the R2 value is only 0.17, indicating that only 17% of the variation in yield can be explained by bee hours. The other 83% is explained by other factors unrelated directly to bee hours (e.g. length of blooming period, overlap of bloom time between varieties, and disease). To make more sense of bee hours, the data over multiple years may be more comparable by tracking hours only from 1% to 100% Nonpareil bloom and yield from a consistent set of blocks – a project for another rainy week. In fact, there are other factors related to honeybee activity that may be a better predictor of potential crop set. One of the biggest is the number of frames in the hive covered with bees. In a warm year, the number of frames covered with bees may not play as large a role in crop set. However, in cold, poor weather years, number of frames makes a huge difference in the foraging capacity of a hive. Honey bees must maintain a sufficient hive temperature of 97o to ensure brood survival, and do this by “shivering” to produce heat. In a 4-frame hive on a cool day, the vast majority of bees will be needed to generate heat, leaving few individuals to forage. In an 8-frame hive on the same cool day, proportionally fewer bees are required to warm the brood, leaving the remainder of the colony to work out in the orchard. Bees from strong 8-frame hives will collect 2-3 times the amount of pollen from 4-frame hives. Perhaps in the future, a different metric for bee activity could be used instead of bee hours. Some beekeepers utilize bee counters to track bee activity into and out of hives. The bee counter in Figure 3 shows bee activity in and out of a hive (green and purple lines) in Durham during the 2019 bloom, from February 15-March 4. The black line shows the associated weight gain of the hive over the season as pollen and nectar was brought back into the hive. 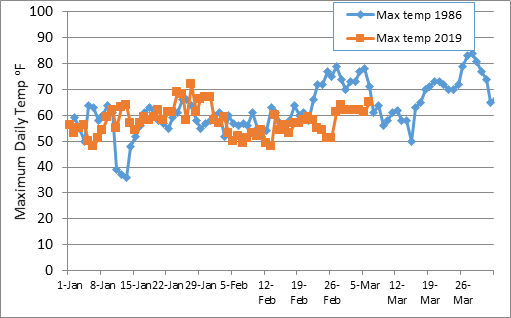 While the weather seemed abjectly bleak for much of bloom, there was bee activity occurring on a fair number of days in this particular orchard (Feb 15-16, Feb 19-23, Feb 28). Beekeeper Randy Oliver has efforts underway to establish a network of hives that may provide bee counter information regionally during almond bloom. In the meantime, efforts to understand bee activity through the bee hour metric will probably not disappear soon. Acknowledgements: This article is a distillation of thoughtful and insightful conversation with numerous parties, including farm advisors Joe Connell (Butte County, Emeritus) and Franz Niederholzer (Colusa, Sutter/Yuba Counties), and beekeepers Randy Oliver and Joe Traynor.